We’ll be the first to say it: Miami didn’t look so hot against an up-and-coming Providence Friars team this past weekend. There were several defensive lapses, a couple of soft goals and a continued string of untimely penalties both nights. Those mistakes were just too much to overcome against the now third-ranked Friars. Sure, the offense was able to make things look good with 2 comebacks to force overtime in both games, but plainly said, the defense needs to be better. Keep an eye on the overtime game winner for Providence. Granted this goal came on a 5 on 3 power play for the Friars, but on a shot from within 2 inches of the goal line, the puck has to stay out of the net. This came just 1 second before 1 of the Miami players was due to come out of the box, and Miami’s efforts to come down from an early 2-0 lead were squandered. Saturday night took on an eerily similar feel to it only half way through the first. Providence was up 2-0 again with just 9:25 gone in the period, but Riley Barber would score his second of the weekend to pull within 1 on a short handed goal. Barber’s goal was scored just 15 seconds after Providence went up 2-0, but they’d return the favor immediately thereafter, and it was another 2-goal hole to climb out of. Obviously not the weekend we wanted. I thought our guys played hard, but we seemed to be making some plays that resulted in goals against. Of course things need to be cleaned up. I thought the good sign is that we were a resilient group. Both Friday and Saturday night we had to come back, but on Saturday we carried the play for the most part, we came back and really took it to them after that. I’m disappointed in the outcomes, but we are going to continue to focus on the process. Here come our three stars and weekend news to use for this week. I get the feeling you’re going to continue seeing our #1 and 2 stars even more this season. 3. Miami’s Penalty Kill on Friday night. I can’t go as far to say both nights here, mainly because they were just 1 of 3 on Saturday night, but Friday night was nearly perfect. Other than the 5 on 3 goal previously mentioned, Miami killed 8 straight penalties. I’ve not seen a box score so lit up with strange penalties. Blake Coleman was hit with a diving penalty but didn’t get the accompanying call on Providence. Kevin Morris got a 10-minute misconduct late in the third, and Chris Joyaux got a 5-minute major and game misconduct with 3 minutes to go. With all of those penalties and shortening of the bench, Miami still got this game into overtime, much to the thanks of this penalty killing unit. 2. As if he didn’t before, Austin Czarnik is really starting to remind me of Andy Miele. I have these memories in my head of #17 skating around the offensive zone with the puck, from behind the net, around the boards, to the blue line, and back to the net. Only instead of the nameplate being Miele, it’s more and more becoming that of Czarnik (minus the 1). I wish Miami kept the “time on ice” (or TOI) stat because I’m certain Z’s would be north of 22-24 minutes for every game. Miele … er … I mean … Czarnik had assists on 5 of the 6 Miami goals this weekend and 5 blocked shots on Friday, to earn himself our #2 star of the weekend as well as the NCHC Offensive Player of the Week award. Let’s take a look at faceoffs quickly, because the box score tells us an interesting story from Friday night. Czarnik took 31 draws on Friday and won just 10 of them. He would recover to win 14 of 26 on Saturday, but overall on Friday night, Miami was just 30 for 78 on the faceoff dot – just 38%. That’s not going to cut it. Miami is now 8 of 29 on the power play (27.6%) and is ranked 9th in the country. As we mentioned in our 3 Stars, the Penalty Kill was great on Friday night, but stunk it up on Saturday night allowing to power play goals. On the season, Miami is sputtering on the penalty kill at just 80.6%, a portion of the game that will need to be improved upon if they want to stay in the top 5 in the rankings. The 2 shorthanded goals indicate that Miami is being their normal selves – very agressive on the penalty kill, which can lead to some openings, and so far this season, it has been to their detriment. Coming into the weekend, Providence was 19 for 19 on their penalty kill – a big reason they were sitting at #8 in the country. They would run that to 23 kills on their first 23 penalties until the third period when Blake Coleman and Barber slammed home 2 PPGs to halt that streak. Miami now has power play goals in 4 of their first 6 games. 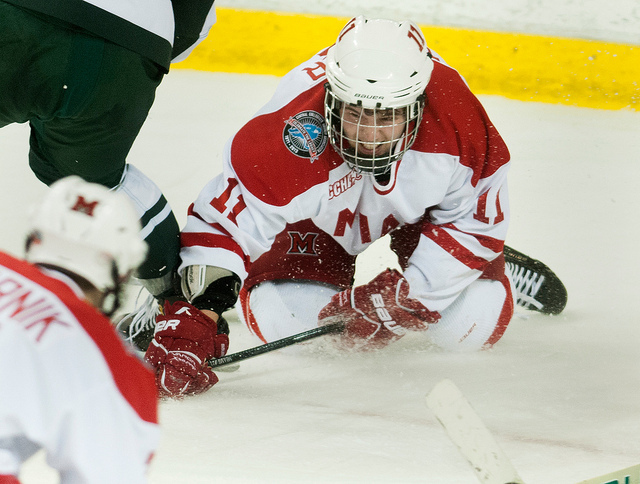 Miami will host Canisius for a 2 game set this weekend in Oxford. Game times are 7:35 Friday night and 7:05 Saturday night. Last year, Canisius made the NCAA tournament, and are 1-2-0 this season. We’ll have more for you later this week. Posted on October 30, 2013, in 2013-14 Weekend Recaps, Three Stars and tagged Austin Czarnik, Providence Friars, Riley Barber. Bookmark the permalink. Leave a comment.